“Classic cold-cellared German lager” brewed in collaboration with Spaten Brauerei stays crisply clean as doughy yeast enticement brings biscuity breading to light lemon-rotted musk, musty peat earthiness and leafy hop astringency. Spritzy carbolic pep awakens the tongue. On tap at Plank Pizza, likable marzen-styled lager places spoiled citrus musk next to wet leafy hop mossing. Earthen Saaz hop earthiness embellishes musky orange-rotted lemon spoilage to nicely counteract its sugary pilsner-Vienna malt glaze. On tap at Biggie’s, dry light-bodied marzen (formerly Goose Oktoberfest) greets dewy earthen peat with floral-spiced Hallertau hops and baked breaded rye malts. Dried apricot and orange illusions fade in the recess. On tap at Shepherd & Knucklehead – Hoboken, dewy earthen minerality picks up sedate toffee-candied sweetness and baked-breaded Vienna malting for stylishly fine moderation. Satisfactory 2016 version soaks orange-oiled lemon souring and sweet-spiced red cherry undertones into crisp leafy hop setting and minor gourd earthiness. On tap at Shepherd & Knucklehead – Hoboken, mild marzen links lightly creamed raw-honeyed Augustiner Vienna malting and biscuity lager yeast to serene citric-spiced briskness and dewy leafy-hopped earthiness. Note: ‘Oak’ in Oaktoberfest refers to Oakland, California’s annual beer festival instead of any true oak influence on the flavor. On tap at Plank Pizza, casual Bavarian-styled bock/marzen merger brings autumnal brown-sugared pumpkin pie spicing to sharp hop astringency and toasted biscuit spine. Ancillary toffee-sweetened dried fruiting registers below gourd-informed surface, leaving these timid bock aspects in the dust. 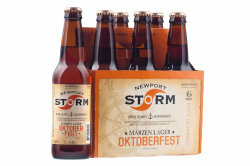 Bettering the majority of American-made marzen lagers, middling medium-bodied fall seasonal offers muddled molasses-buttered toffee sweetness to dry leafy hop bittering, mild tea-like dewiness, light sugar spicing and brown-breaded bottom. Nothing distinctive, but quite refreshing. Off-balanced marzen lager lacks distinct flavor profile. Spicy dry-hopped murk and bland crystal-pale malting become overly astringent. Earthen grape mold sours citric-perfumed musk and nutty brown-breaded base. Ineffective copper-hazed Octoberfest-styled rauchbier loses initial beechwood-flamed campfire sentiment and peat-smoked barleymalt access to less appealing lemon-soured briskness. Maple-glazed bacon niche muted by arid carbolic fizz. Despite amiably scrunching together leafy autumnal dewiness, grouty citric hops and mild orange-red fruiting, busy 2013 medium body’s drawback may be the ascending acidic astringency undermining its fruitful indulgences. Wavered bruised apple, navel orange, tangerine, cherry and pumpkin illusions never fully form. Hardened marzen drinkers may be swayed favorably by the oncoming citric-soured putridity graduallycontrasting the initial sweet-fruited juicing. Uninteresting limited edition autumnal dry body lacks pizzazz and stays bland. Soured fig and grape illusions disrupt caramelized marzipan center as nasty diacetyl buttering depletes cheap Chardonnay snip.